The Chefs Design 1214 French Roaster is a durable, attractive, functional, professional quality aluminum cookware from Wisconsin Aluminum Foundry, the company bringing you heirloom quality cookware since 1915. Based on a traditional French design, Chefs Design French Roasters are a modern update to the classic roasting pan. Manufactured to the highest culinary standards, these heavy aluminum roasters offer unsurpassed cooking performance. Oven safe up to 450°F/232°C, these roasters are easy to clean, even after years of heavy usage. 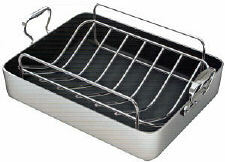 Includes heavy-gauge, stainless steel wire roasting rack & care & use sheet. Interior dimentions: 14" x 10" x 3"
Overall dimensions: 16.25" x 10" x 5.5"